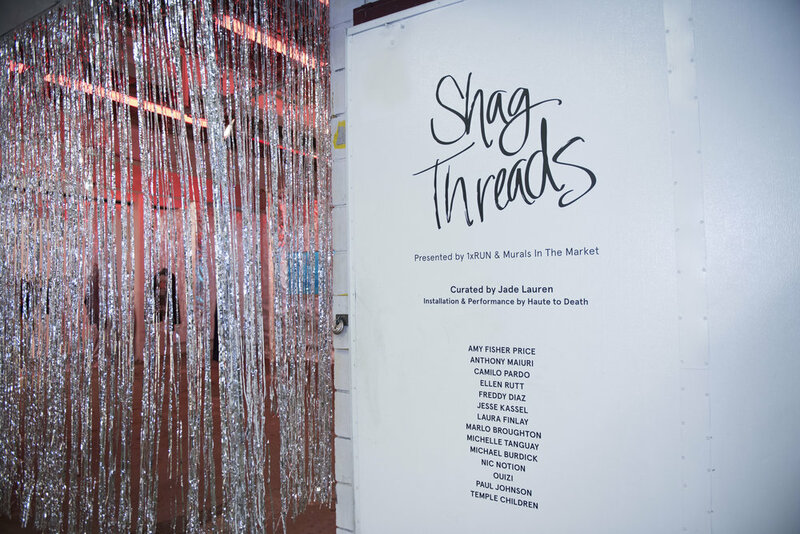 Murals in the Market colloborated with local photographer and stylist, Jade Lauren and dance duo and creatives, Haute To Death for a night of unforgettable art and sound - Shag Threads. Jade Lauren is a Detroit based artist that has had pieces most recently featured at TYP Collection and Inner State Gallery, but her work has taken her as far as Myanmar and Bali. For this year's 3rd annual Murals in the Market she finds herself colloborating with a roster of heavy hitting local artists like Ouizi, Meggs, Amy Fisher Price to create one of a kind, wearable art. Event attendees will have the chance to purchase the hand painted pieces at the exhibition opening. Providing the soundtrack for the evening was Haute to Death, the Detroit-based dance party and nightlife brand created by Jon Dones and Ash Nowak. They have been self described as "the champagne bottle *pop* in the back seat, the satisfying *snap* of breaking a hood ornament off an expensive car, Haute to Death is an anthem of the new, American classic". The innovatie duo not only found themselves tagging in as the evening's sound selectors, but also lending their eyes for impeccable detail to the design as seen in the creation of the Murals in the Market HQ environment for the entirety of this year's festival.